Forage Modern Workshop is pleased to announce Looking For Something Bigger, an interactive installation by Minneapolis based artist Preston Drum. Drum’s interactive installations present a stage of distortion, using everyday objects to create a blurred version of reality. Using materials such as cardboard, wood, drawings, paintings, video, and re-purposed materials, Drum will transform Forage Modern Workshop into a make-shift studio, an environment inspired by relocating his current studio space. Looking For Something Bigger testifies to the continued fascination of the artists’ studio as a concept, psychological construct, social point or periphery, a site of identity, a site of performance and myth. 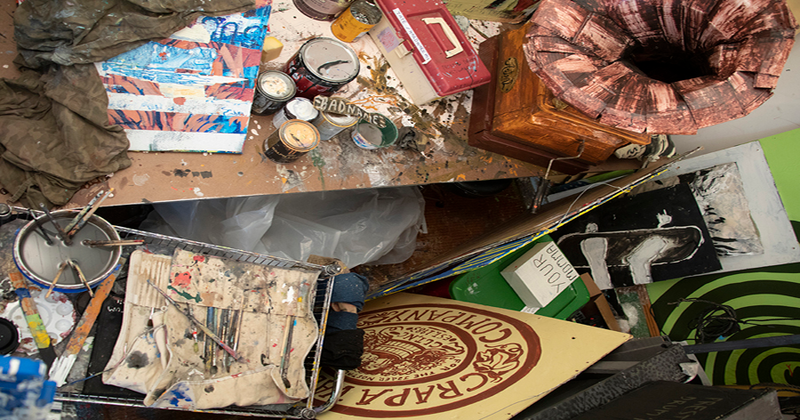 It presents a pause in time of either factual or fictitious process of production, transforming the artists’ studio from an enclosure to a realm of openness. Preston Drum’s work has been exhibited at Jonathan Ferrara Gallery in New Orleans, Minneapolis Institute of Art, Walker Art Center, and The Soap Factory in Minneapolis.